Apple’s Preview is more than just a fast and efficient program for reading PDFs, viewing graphics, and running slide shows. The version that comes with Mac OS X 10.5 (Leopard) has some powerful features stashed away in its menus. Now you can enhance your images, annotate and merge PDFs, print multiple images on one page, and more—all without opening a specialized (and often expensive) image editor or PDF tool. Read on to discover eight great things you can do with Preview. One of the best things about Adobe’s Portable Document Format (PDF) is that it allows you to share documents while making sure that everyone sees the same layout, even if the recipients don’t own the software that created the document. You can create PDF files from the Print dialog box of any Mac OS X program and then send them to friends and colleagues. In the past, if you had detailed comments about the PDFs your colleagues sent you, you were stuck—you couldn’t change the text, so you had to put your suggestions in another file, such as an e-mail message. Alternatively, someone in your group had to buy a copy of Adobe’s $449 Acrobat Professional 8 ( ) to allow you all to add comments directly to the file. But Leopard’s Preview lets you add notes, highlight and strike through text, or use ovals and rectangles to call attention to specific sections of the page. You can even add links to other pages in a document or to Web sites. Best of all, other PDF readers—including both Mac OS X and Windows versions of Adobe Acrobat Reader—can view all of these annotations. Share Comments: Preview lets you mark up your documents through a variety of annotation tools, including ovals and notes, as you see here. To add comments, choose Add Note and then click where you want the note to appear; you’ll see a small yellow icon that looks like a speech bubble. Place this wherever you like. Enter your text in the yellow box that appears in the margin. To move a note’s icon later, double-click on it. A dark box around the icon means that it’s selected. You can then drag it to a new location. Say you need to quickly resize or crop an image to send to a friend or post on your blog. There’s no need to open an image editor—Preview’s image-editing features can do the trick. To crop an image, open it and then click on the Select button in the toolbar (if you don’t see a square on this button, click and hold it and choose Rectangular Selection). Click and drag to create a rectangle around the area you want to crop. You can resize this rectangle by dragging one of its corners, or you can move it if you need to. Then choose Tools: Crop or press Command-K. If you like what you see, save the file; if not, press Command-Z to go back to the original image. Sometimes you have a picture of a person or an object that’s in front of a confusing background, and you’d really like to see that person without the clutter. Preview has two nifty features that let you do this—Instant Alpha and Extract Shape. To use the first, open a picture and then click and hold the Select button in Preview’s toolbar. From the menu that appears, choose Instant Alpha. Next, click and drag to remove background areas of the image. Start by dragging small areas to see how Preview expands the selection. You don’t have to get everything in one pass—just click and drag again to add to your selection. If you make a mistake, press the escape key to remove the selection altogether or option-drag to deselect particular areas. When you’ve highlighted everything you want to remove, press return to crop the background from your picture. Using Extract Shape is even easier. Choose it from the Select button menu, and then start drawing a line around the item you want to retain in your picture. As you do this, a thick red line follows your cursor. Make sure to draw entirely around the item you want to keep; continue until you’ve joined the beginning and end of your line. You’ll then see a number of handles on the line. Move any of these if you need to improve part of your outline. Don’t worry about drawing perfectly. The magic starts when you press return—Preview calculates what to keep, and removes your picture’s background. In many cases, you’ll be able to crop out all the dreck the first time, though with some pictures you may need to repeat the process a couple of times. Adjust Colors: Don’t bother opening an image editor when you need to make a few enhancements to your picture. Preview’s Adjust Color palette lets you tweak colors, brightness, and more. 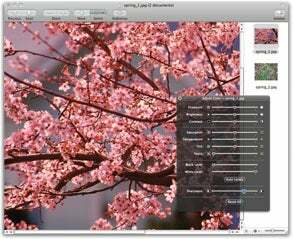 Programs such as Apple’s iPhoto offer tools to adjust image color, brightness, and exposure, but what if you simply want to adjust a single image without adding it to your iPhoto library, or you don’t have the iLife suite. Open the image in Preview and then choose Tools: Adjust Color. The tools in this palette let you tweak your picture’s color balance and brightness and even add a sepia tone to it (see “Adjust Colors”). Move the different sliders to see, in real time, what your picture will look like if you save your changes. For pictures that are too dark or overexposed, try clicking on the Auto Levels button to see if that fixes them. It’s a shame to waste a lot of paper printing a handful of images one to a page. 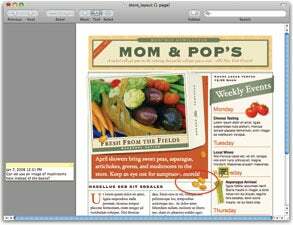 While many programs let you print a bunch of images on a page, they typically require multiple steps to do so. Preview has a printing trick that does it automatically. First, put all your images in a single Preview window. If you already have one image open, display Preview’s sidebar and then drag the other images from the Finder to the sidebar. If you don’t have any images open, you can open them at once by dragging them all onto Preview’s icon in the Dock or in the Finder. Next, select all the images in the sidebar by clicking on one and then pressing Command-A. Now choose File: Print Selected Images, or press Command-P. In the dialog box that appears, choose the number of images you want on each page from the Images Per Page pop-up menu. (Don’t see this? Reveal more options by clicking on the disclosure triangle to the right of your printer’s name.) You can choose to have multiple copies of each image if you check the Print N Copies Per Page option; otherwise, each image is printed once. You can add Spotlight comments to any file by selecting it in the Finder, pressing Command-I, and typing in the Spotlight Comments field. But if you send files by e-mail or iChat, or even just transfer them over a network, comments added in this way disappear. To add keywords permanently in Preview, open the file and select Tools: Inspector (or press Command-I). In the palette that appears, click on the Spotlight tab. Click on the plus sign (+) to add a new keyword, and then type your text. You can add as many keywords as you want. (Note that this doesn’t work for images in PNG format.) When you’re done, save the file. Now these keywords will stay put, no matter where the file travels. You’ll find them in the Finder’s Info palette (Command-I) in the More Info section, listed under Keywords.